"Star Wars" is sending us a VR scavenger hunt to find the Force and get us pumped for "The Last Jedi"
We’re a mere 113 days away from the release of Star Wars Episode VIII: The Last Jedi, and honestly, we didn’t think we could be more excited. But naturally, Star Wars is upping the stakes — and our anticipation. LucasFilm is following up their 2015 The Force Awakens Force Friday media campaign with Force Friday II, a weekend-long promotion for The Last Jedi, during which new Star Wars products will finally hit shelves. But this event won’t just be about finding the best Poe Dameron merchandise. This weekend will launch the “Find the Force” campaign, an incredible augmented reality adventure, where fans can unlock facts, characters, and even battle the dark side. Beginning in the early hours of September 1st (aka Force Friday) and ending on Sunday, September 3rd, fans in 30 countries all over the world will be able to play along as they shop in nearly 20,000 retail sites across the globe. And it turns out that it’s pretty easy to join in on the fun. 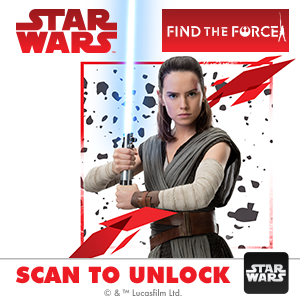 All fans have to do is download the latest version of the official Star Wars app to get started and then find and scan the “Find the Force” logo when shopping to unlock a new character, which will appear “life size” in the room. According to LucasFilm, 15 new characters will be unlocked over the course of the weekend for you to hang out with. But that’s not even the best part. Fans are encouraged to share videos and photos from their “Find the Force” experience on social media using the hashtags #FindtheForce and #sweepstakes for a chance to have the best time ever at the premiere for The Last Jedi in December. You don’t have to tell us twice to get in on that.